Next generation of smart wearable device will feature more powerful AI capacity. The next generation of Microsoft HoloLens will feature a smarter processor designed specifically to power advanced AI operations, the company has revealed. 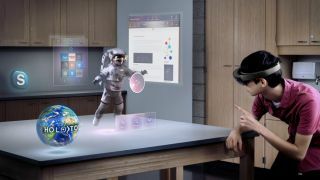 Microsoft will design and build the new chip for HoloLens 2, which could be released as early as Christmas, as it looks to embue its wearable devices with more powerful machine learning capabilities. The new chip will act as a coprocessor running alongside the custom Holographic Processing Unit multiprocessor featured in the first iteration of HoloLens. It will be used to run deep learning neural networks within the device's hardware, helping to train AI and other algorithms. Designing its own hardware offers a number of advantages for Microsoft and HoloLens as the company looks to provide a more powerful offering for its second generation device. Having the AI running directly on the device should cut down on latency, allowing for faster software operations as there is no need to connect to a central cloud-based system. The change will also mean that HoloLens' connected services will continue to run even if Internet access is lost. “The AI coprocessor is designed to work in the next version of HoloLens, running continuously, off the HoloLens battery. This is just one example of the new capabilities we are developing for HoloLens, and is the kind of thing you can do when you have the willingness and capacity to invest for the long term, as Microsoft has done throughout its history,” said Marc Pollefeys, director of science at Microsoft’s HoloLens division.